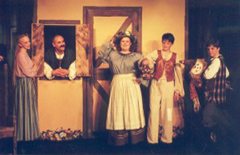 In May 1994, New Moon Productions (NMP), a children’s theater company, was incorporated as a non-profit organization in Texas. By the end of 2002, New Moon had produced 50+ full-scale productions and enabled over 7,500 youth to participate in theatrical productions, drama classes, and summer camps. In 2003, New Moon’s co-founders, Michael Wehrli and Pamela Stringer, moved to Portland, Oregon. Since their arrival, New Moon has offered Drama Literacy Classes at Grout Elementary School, Lewis Elementary, and Roseway Heights School, and theater performance classes, workshops, and summer camps at many locations all over Portland (see details on our facts sheet). In December 2003, New Moon produced “A Christmas Chaos” with a youth cast at the Interstate Firehouse Theater and an adult cast at the Multnomah Arts Center. From 2004 to 2008, New Moon co-produced a four week summer musical theater camp with SUN Community Schools and Portland Parks & Recreation. This innovative program saw 50-80 children rehearsing and performing in a full scale musical at the Washington Park Amphitheatre and featured a strong mentorship aspect in which all the summer camp instructors and college interns put on an adult cast production of the same show. In 2006, New Moon began the self-enhancing “Share Your Story: A Play or Musical Creation Workshop”, co-created by Kristina Jones and Michael Wehrli. 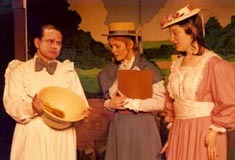 In this unique program, students create and then perform a musical or straight play based on an idea or issue of great importance to them. In October 2009, New Moon produced “Found Lives”, a new play that explores the inner lives of people with schizophrenia and their caregivers in their own words. This play received its world premiere at Artist Repertory Theater. To date, New Moon has provided over 25,000 children with enriching theater experiences, both in the classroom and on stage, and presented engaging and memorable performances to over 65,000 audience members. We continue to offer high-quality children’s theater programs, summer camps, and school break camps. I am so impressed with Michael Wehrli and with New Moon Productions. You are able to inspire all of us! You are one of my heroes. “Share Your Story” is truly a magical and life-affirming program.